Spider Lily Translations blog: Rose Guns Days Trial is out! Rose Guns Days Trial is out! 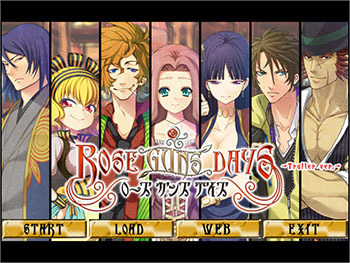 07th Expansion, the writing circle behind Higanbana no Saku Yoru Ni, Umineko no Naku Koro Ni, and Higurashi no Naku Koro Ni, have put out a demo for their latest novel, Rose Guns Days. RGD is a hard-boiled action novel expected to be released next month during the Comic Market at Tokyo Big Sight between August 10th and 12th. Witch-hunt, the group behind the English translation of Umineko no Naku Koro Ni, will handle translating RGD into English. Check out the Japanese demo [480mb] here! Update: Mac version (courtesy Yirba) here! I thought I read that Rose Guns Days wouldn't be sold at Comiket? Might be wrong. Anyway, I checked out the trial, and the graphics, music, etc. fitted together really well. The fighting minigame was fun, too. I look forward to getting my hands on a copy, as well as being able to read it in English, of course.